Despite its latitude and longitude - and its location so far north of the Caribbean, nearly a thousand miles north of it in fact - Bermuda is entirely frost-free, snow-free and ice-free. Why? Because the warm waters of the Gulf Stream pass near Bermuda. Enough annual rainfall is one reason why Bermuda is usually lush in foliage and greenery despite its very shallow alkali soil. There is no monsoon or rainy season because Bermuda is not in the Caribbean, but some months tend to be wetter than others. But others can be devoid of much rain. Also, several - like late June, July and August in particular and early September - can be extremely (and unpleasantly) humid. If this affects you badly, and you don't mind cooler water for swimming, then try May or June or late September to October. For weather forecasts, check the Bermuda Weather Service page. It is a Bermuda Government service, provided by the Ministry of Transport's Department of Air Operations. Showing mean (average of high and low for month) figures, much cooler in winter than the Caribbean or Florida. Average daily figures. They can vary substantially month-by-month. But on a year-by-year basis, the accumulated figures do not vary by much. Rain and rainstorms generate the island's only supply of fresh water. There is no central piped-in water supply except to a few few places. When there is insufficient rain, water is ordered and paid for from Government reservoirs or seawater distillation plants and delivered by water truckers. Outdoors in December-February can be chilly at times, especially in frequent winter gales. Indoors, most Bermudians don't have central heating in their homes as you do in USA, Canada, Europe and UK, but open fires in one room or electric heaters. Bring some some wool clothing in the winter months. Bermuda Temperature Variations. The year-round mean relative humidity is 77%. But in the months of May through October, it is much higher. It is energy-sapping, debilitating, chronic, with a need to change clothes three times a day. Most northern USA, UK, European and Canadian nationals are not told about it and some can get a very severe heat and humidity rash from it. For those potentially affected badly by a combination of heat and high humidity, it is recommended that when you holiday in Bermuda, you come in other - winter - months when humidity is lower. Beware the Hurricane! Book by the late Bermudian author Terry Tucker. 2018. August 8. An American-based meteorology group has said cool water in the Atlantic could lead to fewer tropical storms this year. Colorado State University’s Tropical Meteorology Project team said: “The tropical Atlantic remains cooler than normal and there is a relatively high potential that a weak El Niño develops in the next several months. The probability for major hurricanes making landfall along the United States coastline and in the Caribbean is below normal due to the forecast for a below-average season.” The university added: “As is the case with all hurricane seasons, coastal residents are reminded that it only takes one hurricane making landfall to make it an active season for them. They should prepare the same, regardless of how much activity is predicted.” The forecast, released last week, said the tropical Atlantic was “anomalously cool” and strong wind shear has been recorded over the Caribbean in the last month. The forecast added: “The tropical Atlantic has also been very dry in July. All these conditions tend to be associated with quieter Atlantic hurricane season." The CSU has forecast nine more named storms before the season ends in November, with three expected to become hurricanes and one a major hurricane. The numbers do not include storms that have already been recorded this year. 2018. July 14. A low pressure system left over from Hurricane Beryl could redevelop as a subtropical storm to the north of Bermuda, weather forecasters said today. But the Bermuda Weather Service added that the system would not pose any threat to the island. Beryl, the first hurricane of the season, which began at the start of June, was upgraded to a hurricane from a tropical storm just over a week ago and headed towards the Caribbean. But the storm collapsed before it made landfall. 2018. July 8. Tropical Storm Chris is expected to bring swell and showers to Bermuda towards the middle of this week. The storm is forecast to come within 395 miles to the west-northwest of Bermuda at 2pm on Wednesday, its closest point within the next 72 hours. The Bermuda Weather Service warned it may move closer after that, depending upon its track. Chris has the potential to strengthen into a hurricane because of warm sea surface temperatures and favourable winds. The BWS said at 6pm today: “Tropical Storm Chris is expected to make its north-northeastward advance on Wednesday, but Bermuda shall remain similar to Tuesday with generally fair skies with only a shower or two in the area. But, as Tropical Storm Chris kicks out, it will drag a cold front on its backside which will send increasing cloudiness and decreasing stability Wednesday night and into Thursday.” At 6pm today, Chris was 571 miles west of Bermuda, with winds of about 52mph and higher gusts. Tropical Storm Beryl, downgraded from a category one hurricane, remains on a slow course towards the Lesser Antilles. It is forecast to bring tropical storm conditions to Dominica and Guadeloupe tonight and strong gusty winds in the Virgin Islands and Puerto Rico tomorrow. The Atlantic hurricane season, which runs from June 1 to November 30, spared Bermuda last year, but battered the Caribbean as well as the United States. Recovery efforts are still under way in islands across the Caribbean, and an above-average season is expected again this year with seas warmer than usual. 2018. July 7. A tropical depression west of Bermuda has strengthened into the third named storm of the season. Tropical Storm Chris is forecast to come within 420 miles to the northwest of Bermuda at 6am on Wednesday, its closest point within the next 72 hours. The Bermuda Weather Service warned it may move closer after that, depending upon its track. The BWS said no significant impact is currently expected for the island, except for some swell and showers towards midweek. Chris has the potential to strengthen into a hurricane because of warm sea surface temperatures and favourable winds, but the BWS said at 6am today: “Fortunately, the broad high pressure ridging will keep the storm at a safe berth from the island, thus making the only potential impacts of this system being shower activity and large long period swell.” At 6am, Chris was 623 miles west of Bermuda, with winds of about 40mph and higher gusts. Tropical Storm Beryl, downgraded from a category one hurricane, remains on a slow course towards the Lesser Antilles. At 6am, Beryl was about 1,400 miles south-southeast of Bermuda. Winds have decreased to about 46mph. The Atlantic hurricane season, which runs from June 1 to November 30, spared Bermuda last year, but battered the Caribbean as well as the United States. Recovery efforts are still under way in islands across the Caribbean, and an above-average season is expected again this year with seas warmer than usual. 2018. July 6. The first hurricane of the season has formed in the West Atlantic. Hurricane Beryl, upgraded overnight from a tropical storm, remains on a slow course towards the Caribbean. However it is expected to dwindle before it reaches the Lesser Antilles late on Sunday. It is said not be a threat to Bermuda. At 6am today, Beryl was nearly 2,000 miles south-east of Bermuda, with winds of 75mph, and gusts of more than 90mph. The Atlantic hurricane season, which runs from June 1 to November 30, spared Bermuda last year, but battered the Caribbean as well as the United States. Recovery efforts are still under way in islands across the Caribbean, and an above-average season is expected again this year with seas warmer than usual. 2018. April 18. A busier-than-average hurricane season is on the cards, a forecast has predicted. Researchers at North Carolina State University said that the Atlantic area could see between 14 and 18 tropical storms with seven and 11 hitting hurricane strength. The NCSU prediction on Monday came two weeks after Colorado State University predicted a slightly busier-than-average season. But the Tropical Storm Risk Consortium forecast a slightly below average season on the same day. The Atlantic has experienced an average of 11 named storms per year since 1950, with an average of seven reaching hurricane strength. James Dodgson, director of the Bermuda Weather Service, said it was still too early to make accurate predictions on how active the new season will be. He added: “Whether it is busy or quiet, it only takes one, so we must always be prepared at the start of each hurricane season.” The hurricane season will begin on June 1 and continue until November 30, but storms can form before or after that period. A total of 17 named storms were recorded last year, including ten hurricanes and six major hurricanes. The Caribbean, Texas and Florida all suffered major damage due to Hurricanes Harvey, Irma and Maria. But Bermuda escaped unharmed. Mr Dodgson had discussions with other meteorologists at a recent meeting of the World Meteorological Organization's Hurricane Committee. He said that due to the significant losses of life and property last year, the committee agreed to retire the hurricane names Harvey, Irma, Maria and Nate. Mr Dodgson said those names would be replaced by Harold, Idalia, Margot and Nigel. 2017. September 27. Rough weather is forecast today as Hurricane Maria, which intensified yesterday to a Category 1 storm, passes to Bermuda’s northwest this evening. While tropical storm force winds are not expected within the island’s marine area, the Bermuda Weather Service predicts “strong winds, a few showers and a chance of thunder”. The storm remains a potential threat to the island, and is forecast to pass 293 nautical miles to Bermuda’s north at midnight. The 2017 hurricane season has proven the most active since 2005, with another hurricane further out in the Atlantic. Lee built into a Category 3 hurricane yesterday, the National Hurricane Centre reported — but was expected to pass nearly 375 nautical miles east of Bermuda last night. While the height of the season elapsed earlier this month, the season does not officially end until end of November 2017. 2017. September 26. Hurricane Maria has been downgraded to a tropical storm but last night remained a potential threat to the island, the Bermuda Weather Service said. The BWS 6pm update said the storm was expected to make its closest point of approach in the next 72 hours at around midnight on Thursday night, as it passes 296 nautical miles to the island’s north-northwest — but the storm could veer closer after that period. A storm is considered a potential threat to a location if it is expected to pass within 400 nautical miles within 72 hours. Maria was 425 nautical miles west-north-west of the island at 6pm, and moving north at 7mph. Meanwhile, Hurricane Lee, which reached Category 2 strength last night, is also considered a potential threat to the island. The storm was 380 nautical miles east of Bermuda at 6pm, moving west at 8mph. While the storm is expected to continue traveling westward in the coming days, it is expected to turn to the northeast in the coming days, making its closest point at 3am on Thursday, when it is predicted to pass 380 nautical miles to the island’s east. 2017. September 25. Hurricane Maria is still considered a potential threat to the island, according to the Bermuda Weather Service. The BWS 6pm update said the Category One hurricane is expected to make its closest point of approach in the next 72 hours on Thursday as it passes 316 nautical miles to the island’s northwest at 6pm, but the storm could come closer after that period. A storm is considered a potential threat to a location if it is expected to pass within 400 nautical miles within 72 hours. However, the system is expected to weaken to tropical storm strength by Wednesday morning. The hurricane was 424 nautical miles west of the island at 6pm and moving north at 7mph. Meteorologists are also watching Hurricane Lee, which is not considered a threat to the island. The Category One hurricane was 735 nautical miles east of the island at 6pm, moving west-southwest at 8mph. While the storm is expected to continue traveling westward in the coming days, it is expected to make a turn to the northeast later this week, making its closest point at 3pm on Wednesday as it comes 469 nautical miles to the island’s east. 2017. September 23. Hurricane Maria was tonight said not to be a threat to Bermuda at present. The storm’s closest approach to the island within three days is expected to be 428 nautical miles to the west at 4am on Tuesday. Maria is packing 100 knot sustained winds and gusts of 120 knots and was moving north at 8 knots at midnight. The Bermuda Weather Service warned that Maria may move closer to Bermuda in the future. Meanwhile, Tropical Storm Lee’s closest point of approach to Bermuda has passed and it is not listed as a threat to the island. Lee at noon was around 782 nautical miles east of Bermuda and moving north at around 2 knots. 2017. September 17. Hurricane Jose will bring strong winds and the risk of thunder as it passes to the west of Bermuda tonight, according to the Bermuda Weather Service. The storm, which has winds of about 90mph and higher gusts, is described as a potential threat to the island. At noon today, it was 371 nautical miles to the west-southwest of Bermuda, heading north at about 9mph. Its closest point of approach to the island is expect to be 2am tonight, when it will be 350 nautical miles to the west. It is forecast to stay off the United States east coast, but could bring tropical storm conditions to some areas, according to the National Hurricane Centre. The Bermuda Weather Service stated at 6pm: “Hurricane Jose, a potential threat to Bermuda, is expected to pass to the west, approximately 350nm, late tonight. Showers and a risk of thunderstorms associated with Jose will then affect Bermuda Monday and Tuesday as Jose continues to move away from Bermuda. The track in the long term remains very uncertain as Jose continues to be a very unusual Tropical Cyclone.” Meanwhile, the storm-ravaged Caribbean is under threat yet again, this time from Tropical Storm Maria, which is expected to strengthen into a hurricane. Over the next four days, Dominica, Guadeloupe, Anguilla and Antigua and Barbuda are all in the line of fire of Maria, which is forecast to become a category three hurricane by Tuesday evening. Maria is not considered a potential threat to Bermuda at this stage. At noon, it was more than 1,200 nautical miles to the east-southeast of the island, and its closest point of approach within the next three days is forecast to be 891 nautical miles to the south on Wednesday. A third system in the Atlantic, Tropical Depression Lee, was more than 1,900 nautical miles east-southeast of Bermuda at noon. It is heading west-northwest, and its closest point of approach within the next three days is forecast to be more than 1,300 nautical miles to the east-southeast on Wednesday. 2017. September 14. Jose was expected to strengthen into a hurricane again today after being downgraded to a tropical storm yesterday. The system — still deemed a potential threat — was forecast to turn north tomorrow and pass to Bermuda’s west early on Monday morning. At noon, the storm’s closest point within 72 hours was forecast to be 377 nautical miles to the west at 4am on Monday. But the BWS warned that the storm may move closer after this time. The Bermuda Weather Service said: “Jose is expected to become a hurricane again by this evening, then turn northward tomorrow. This system is now passing slightly further away to the west than in yesterday morning’s forecast but remains a potential threat to Bermuda.” Jose was 423 nautical miles to the south-southwest of Bermuda at noon and heading west-northwest at 9mph with maximum sustained winds near 70mph. Meanwhile, Tropical Depression 14 has formed in the Atlantic but the BWS said the system is not deemed a threat “at this time”. 2017. September 13. Hurricane Jose’s closest projected point of approach to Bermuda over the next three days has come and gone, the Bermuda Weather Service said yesterday. The category one storm, meandering south of the island, nonetheless remains a potential threat to Bermuda. It is forecast to head northwest over the weekend, by which time it is expected to be downgraded to a tropical storm. However, as of last night, its closest point to Bermuda, 313 nautical miles to the south-southwest, had already passed. At 6am, Jose was 377 nautical miles to the island’s south and heading southeast at about 8mph as it makes its “clockwise loop over open water”. The weather service said Jose could bring isolated showers and a chance of thunder on Thursday evening. “Seas will remain slight to moderate with building southerly swells from Hurricane Jose on Thursday and Friday. Hurricane Jose is forecast to weaken to a tropical storm on Friday as it turns north-westward. Tropical Storm Jose will likely remain a potential threat to Bermuda through Sunday.” According to BWS, the threshold for being deemed a potential threat is 400 nautical miles. 2017. September 12. Hurricane Jose, meandering over the Atlantic Ocean, nonetheless remains a potential threat to Bermuda. At noon, the storm’s closest point was expected to be 329 nautical miles to the south-southwest of Bermuda at 8pm today. According to the Bermuda Weather Service, the threshold for being deemed a potential threat is 400 nautical miles. Jose was downgraded to a category one storm this morning and was forecast to become a tropical storm later today. The system is still expected to make a “clockwise loop over open water” and the BWS said it would then become a hurricane again. The long-term forecast added that Jose is then expected to start a northwesterly path to the east of the Bahamas on Friday. 2017. September 11. Hurricane José remains a potential threat to Bermuda this afternoon after moving within 500 nautical miles south of the island. The storm’s closest point in the next 72 hours is expected to be 358 nautical miles to the south-southwest of Bermuda at 10am tomorrow, according to the noon update from the Bermuda Weather Service. At noon, José was at Category 2 strength, but by this afternoon it is forecast to have weakened to Category 1. The Weather Service said José is forecast to continue tracking northwest before making a tight, clockwise loop back to the southeast, followed by another turn west, which would take it away from the island. The threshold for being deemed a potential threat is 400 nautical miles. José at noon was 466 nautical miles south-southwest of Bermuda and headed north at 9mph with maximum sustained winds of 103mph and higher gusts. Alison Hill, CEO at the Argus Group, said in a statement released today: “We encourage everyone to be vigilant and ensure that their insurance policies are up to date. While Hurricane José is expected to pass by 350 nautical miles from Bermuda, it’s important to be cautious and to keep up-to-date on any last-minute weather changes.” She urged people to call Customer Service Centre on 298-0888 for support. 2017. September 8. Hurricane José rose to Category 4 this morning, but the Bermuda Weather Service said it was still not a threat to the island “at this time”. The storm’s closest point of approach in the next 72 hours was expected to be 505 nautical miles to the island’s south-southwest, according to the BWS noon update. But forecasters warned the storm could come closer after that time. The service’s long-term forecast said José “might have become a potential threat” by Monday or Tuesday although the storm is expected to weaken by then. But it added that forecast models still show a variety of possibilities, especially for the exact track of José in the long range. The American-based National Hurricane Centre said the storm reached Category 3 strength yesterday afternoon which made it the third major hurricane of the season. In a subsequent update at 11am this morning, the NHC said the “extremely dangerous” storm had reached Category 4. José at noon was about 1,047 nautical miles south-southeast of Bermuda and headed west-northwest at 18mph with maximum sustained winds of 150mph and higher gusts. 2017. September 7. Hurricane José has reached Category 3 strength, but the Bermuda Weather Service said it is not a threat to the island “at this time”. As of 6pm storm’s closest point of approach within the next 72 hours was expected to be 599 nautical miles south at 6pm on Sunday. However, the BWS warned the system could come closer after that time. According to the US-based National Hurricane Centre, the storm reached Category 3 strength this afternoon, making it the third major hurricane of the 2017 season. At 6pm, José was about 1,214 nautical miles southeast of Bermuda and was headed west-northwest at 18mph, boasting maximum sustained winds of 120mph with higher gusts. A hurricane watch has been issued for the dual-island nation of Antigua and Barbuda, while a tropical storm watch is in effect for Anguilla, Montserrat, Saint Kitts and Nevis, Saba and Sint Eustatius. The news came as Category 5 Hurricane Irma — one of the strongest hurricanes ever recorded in the Atlantic — caused widespread destruction across the Caribbean, reducing buildings to rubble and leaving at least nine people dead. Packing winds of 185mph, the storm made landfall in Antigua and Barbuda early yesterday. While Antigua escaped major damage, Prime Minister Gaston Browne said Barbuda had been left “barely habitable”. Irma also caused major damage in Saint Martin — an island comprised of French territory Saint-Martin and the Dutch section Sint-Maarten — and the nearby French territory Saint-Barthelemy. Meanwhile, more than half of Puerto Rico’s three million residents were without power and at least one death has been reported in Anguilla, while the British Virgin Islands were also battered by the storm. The Dominican Republic, Haiti, Turks and Caicos, Cuba and the Bahamas are also in Irma’s path and there is a possibility it will hit Florida over the weekend. Mandatory evacuations of vast areas of coastal South Florida began yesterday. Irma is expected to weaken over the next few days, but the NHC said the storm could remain Category 5 until sometime tomorrow. The BWS said the storm is not considered a threat to Bermuda “at this time”, with its closest point of approach within 72 hours having past. As with Hurricane José, however, the BWS warn that the storm could come closer after the 72 hour window passes. Hurricane Irma, which is so strong it is even showing up on seismometers for measuring earthquakes, follows in the wake of Hurricane Harvey, which caused catastrophic flooding in Texas since it made landfall as a Category 4 storm on August 25. James Dodgson, director of the Bermuda Weather Service, said Hurricane Irma is being kept away from the island by a strong Bermuda-Azores ridge of high pressure. He explained: “This has the associated impact of steering Irma on its current west-northwestward track just north of the Greater Antilles and towards the Florida peninsula.” While he said José is being steered by the same ridge, a weakness in the ridge is forecast to develop this weekend, potentially allowing the storm to make a northward shift. Mr Dodgson added: “At this stage it is too early to say if José will continue on that track or will in fact deviate from that track. Model consistency and confidence is currently poor in the long-range forecast projections for José.” And he urged the public to keep a close eye on BWS forecasts at www.weather.bm and tropical update bulletins as the hurricane season continues. Meteorologists are also watching Hurricane Katia, which formed in the Gulf of Mexico and reached hurricane strength yesterday afternoon. The National Hurricane Centre said the storm was yesterday moving towards the east-southeast at around 3mph and should gradually turn southeastward during the next 24 hours. On the forecast track, the centre of Katia is expected to remain offshore of Mexico through Friday morning. Mr Dodgson said that the Atlantic is now at the height of the hurricane season, with all of the “nascent ingredients” just right for storm development. He added: “This season has also been forecast to be more active than average due to two main factors — anomalously warm sea surface temperatures as well as reduced wind shear in the main tropical regions where hurricanes form. Increased wind shear prevents tropical cyclones from developing and maturing as it literally rips apart the forming system. With the latest early August official NOAA Atlantic hurricane season forecast update calling for up to as many as 19 named storms, we still have some way to go, as even with developing Tropical Storm Katia, that only brings the named storm tally to 11 so far. The official season continues for almost another three months, until the end of November.” He said it was not unusual to have multiple major storms active in a short span of time. Mr Dodgson added that four Category 4 storms were recorded in 2010 between late August and September. 2017. September 6. Tropical Storm Jose has reached hurricane strength, but the system is not a threat to Bermuda “at this time”, according to the Bermuda Weather Service. The storm’s closest point of approach within the next 72 hours is expected to be 836 nautical miles south-southeast at 6pm on Saturday. However the BWS warned the system could come closer after that time. According to the US-based National Hurricane Centre, additional strengthening is expected, and Jose could be approaching major hurricane strength on Friday. At 6pm, Jose was about 1,517 nautical miles southeast of Bermuda and was headed west-northwest at 16mph, boasting maximum sustained winds of 75mph with higher gusts. According to the NHC, a slightly faster west to west-northwest motion is expected during the next two days. Meanwhile, Category 5 Hurricane Irma — one of the strongest hurricanes ever recorded in the Atlantic — made landfall in Barbuda early this morning. Packing winds of 185mph, the system battered the tiny island of about 2,000 people before moving towards Saint Barthelemy and Saint Martin, where it destroyed major buildings and caused serious flooding. Puerto Rico, the Dominican Republic, Haiti and Cuba are also in Irma’s path and there is a possibility it will hit Florida over the weekend. A mandatory evacuation order was given for the Florida Keys. The BWS said the storm is not considered a threat to Bermuda “at this time”. At 6pm today, its closest point of approach within 72 hours was said to be 758 nautical miles to the south-southwest at 2pm tomorrow. It may get closer after that point. Hurricane Irma, which is so strong it is even showing up on seismometers for measuring earthquakes, follows in the wake of Hurricane Harvey, which caused catastrophic flooding in Texas since it made landfall as a Category 4 storm on August 25. Meteorologists are also tracking Hurricane Katia, which formed in the Gulf of Mexico and reached hurricane strength this afternoon. According to the NHC, the system is moving towards the east-southeast near 3mph and should gradually turn southeastward during the next 24 hours. On the forecast track, the centre of Katia is expected to remain offshore of Mexico through Friday morning. However, a Hurricane Watch is in effect for the state of Vera Cruz. 2017. August 19. A new Tropical Storm, Harvey, has developed in the Caribbean, dumping heavy rain on the Windward Islands yesterday as it makes a slow trek west towards Central America. The storm, which has the potential to build into the season’s third hurricane, is followed by two other pockets of weather: a disturbance several hundred miles to Harvey’s east, and a tropical wave budding off the West African coast. Meanwhile, the remnants of Hurricane Gert, breaking apart into a storm, continues its drift towards Ireland and Britain. The 2017 Atlantic season has already shown above-average activity, and late August through early October is its typically height. According to meteorologists, the tropical Atlantic at present is at its warmest since 1950. A powerful atmospheric phenomenon known as the Madden-Julian Oscillation could be feeding storm development at the moment, but should decline early next month, resulting in less favorable hurricane conditions. 2017. August 16. Hurricane Gert is no threat to Bermuda as the closest point of approach has passed. The category one storm was forecast to pass 281 nautical miles to the north-northwest of the island at 8am and had been deemed a potential threat. In its noon update, the Bermuda Weather Service said this had been downgraded to no threat. A spokesman said: “Hurricane Gert has now passed its closest point to Bermuda and will continue to speed NE and away from the area causing swells to become westerly. A frontal boundary, invigorated by the influx of moisture from Gert, will dip south towards us bringing showers, a risk of thunder and occasionally strong winds tonight through Friday. Winds drop light to moderate for the weekend as the boundary lingers nearby.” At 12pm, Gert was about 309 nautical miles north of Bermuda, boasting maximum sustained winds of 80 knots and gusts of 100 knots. While the US National Hurricane Centre said some strengthening is still possible today, Gert is expected to weaken and become an extra-tropical low by Thursday night. 2017. August 13. Tropical Depression 8 in the Atlantic has been upgraded to a Tropical Storm and has been described as a potential threat to Bermuda. Tropical Storm Gert has winds of 30 knots and gusts of 40 knots and is forecast to pass 245 nautical miles to the north-north-west of the island on Tuesday at 7pm, although the Bermuda Weather Service says it may move closer after that point. At 6pm today, it was 437 nautical miles to the south-west of Bermuda, travelling in a north-north-west direction at a speed of 9 knots. 2017. August 10. An “above average” Atlantic hurricane season is likely, with two to five storms potentially evolving into major systems. The National Oceanic and Atmospheric Administration this week forecast 14 to 19 named storms, with five to nine developing into hurricanes and between two and five reaching Category 3 strength of 111mph or more. Category 3 storms, which include Hurricane Nicole last year and Fabian in 2003, can result in significant structural damage and flooding of coastal areas. In May the agency predicted 11 to 17 storms. The systems are named once their winds attain speeds of 39mph. NOAA revised its forecast as a result of the likely absence of the Pacific El Niño, which is capable of exerting a major influence on storms in the Atlantic. Hurricane season runs from June 1 to November 30, with its most active phase spanning six weeks from August 20, and peaking on September 10. On average, the Atlantic season will spawn 12 storms. Six tropical storms have formed thus far in 2017: Arlene, Bret, Cindy, Don, Emily and Franklin. Last year’s season was notably active, with 15 named storms, seven hurricanes and four major hurricanes. 2017. April 7. An early forecast for the 2017 hurricane season has predicted a slightly below-average number of named storms this year. The forecast, released yesterday by Colorado State University, estimates that the Atlantic will experience around 11 named storms in 2017, based on present conditions and trends from over the past three decades. Of those storms, four are expected to reach hurricane strength and two are expected to become major hurricanes, reaching Category 3 strength or stronger. The estimates are slightly below the 30-year average of 12 named storms, six hurricanes and two major hurricanes. However, the report noted that it was impossible to “precisely predict” the season this early in the year, adding: “We issue these forecasts to satisfy the curiosity of the general public and to bring attention to the hurricane problem. There is a general interest in knowing what the odds are for an active or inactive season. One must remember that our forecasts are based on the premise that those global oceanic and atmospheric conditions which preceded comparatively active or inactive hurricane seasons in the past provide meaningful information about similar trends in future seasons.” One factor cited for the estimates is the potential return of El Niño, a weather phenomenon that causes high wind shear in the Atlantic that can inhibit the development of tropical storms. Meanwhile, the waters in the North Atlantic are reportedly colder than average, which is unfavorable for the growth of hurricanes. “The tropical Atlantic has anomalously cooled over the past month and the far North Atlantic is relatively cold, potentially indicative of a negative phase of the Atlantic Multi-Decadal Oscillation. We anticipate a below-average probability for major hurricanes making landfall along the United States coastline and in the Caribbean.” Despite the estimate of a quieter-than-average hurricane season, the report cautioned that even a single storm can be devastating. “As is the case with all hurricane seasons, coastal residents are reminded that it only takes one hurricane making landfall to make it an active season for them,” the report warned. “They should prepare the same for every season, regardless of how much activity is predicted.” The 2017 Hurricane Season officially begins on June 1. 2017. March 28. The US-based National Hurricane Centre has unveiled new policies, which could help give Bermudians more advanced warning of impending storms. Under the new policies, unveiled earlier this month, the NHC will issue advisories for systems with the potential to become tropical cyclones and publish estimated timings for when winds in an area could reach tropical storm strength. Kim Zuill, director of the Bermuda Weather Service, said that the moves would assist those living on the island. “The ability for the NHC to now issue advisories on those potential tropical cyclones, which may form so close to land as to pose a threat, results in an improvement to BWS being able to issue watches and warnings for our community,” she said. “This is particularly important in our area where there are several triggers which contribute to formation near Bermuda, including — but not limited to — the warmer water of Gulf Stream and the position of the Bermuda-Azores High.” Asked about examples where the new policy might have helped the island, she noted Hurricane Karen in 2001, which built from a low-pressure disturbance to a tropical storm on our doorstep. While it did not reach hurricane status until it was moving away from the island, it destroyed vegetation and downed power lines, leaving more than two-thirds of the island without power. “We couldn’t issue tropical watches and warnings until the NHC named it. However, BWS did have gale and storm warnings out,” Ms Zuill said. “A more recent example from this past season, this system would have assisted Jamaica issuing watches and warnings in association with Hurricane Matthew.” She added that the BWS would discuss the changes in more detail during Hurricane Preparedness Week, which will take place before the start of the 2017 hurricane season on June 1. The NHC said that pending final approval, it would have the option of issuing advisories, watches and warnings for disturbances that are not yet a tropical cyclone, but which pose the threat of bringing tropical storm or hurricane conditions to land areas within 48 hours. “Under previous longstanding NWS policy, it has not been permitted to issue a hurricane or tropical storm watch or warning until after a tropical cyclone had formed,” the statement said. “Advances in forecasting over the past decade or so, however, now allow the confident prediction of tropical cyclone impacts while these systems are still in the developmental stage. 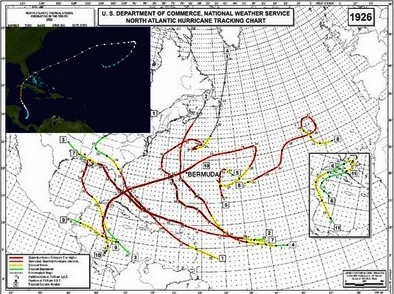 “For these land-threatening ‘potential tropical cyclones’, NHC will now issue the full suite of text, graphical, and watch/warning products that previously has only been issued for ongoing tropical cyclones.” The NHC also stated that it would begin to introduce “experimental” time of arrival graphics, highlighting when winds are expected to reach tropical storm strength. 2016. August 12. Residents may have to brace themselves for another mighty storm after US forecasters predicted that this year could be the busiest Atlantic hurricane season since 2012. According to the Associated Press, the National Oceanic and Atmospheric Administration’s updated outlook indicated 12 to 17 named storms, including five to eight hurricanes — two to four of which could be “major”. On average, the US gets 12 named Atlantic storms a season, including six hurricanes, three of them major. The El Niño effect in the Pacific that tends to reduce Atlantic hurricane activity is now dissipating. Gerry Bell, of NOAA’s Climate Prediction Centre, said the opposite phenomenon, La Niña, may form as the six-month season peaks, but should not have a significant impact. Hurricanes are severe subtropical or tropical storm with heavy rains and intense winds which blow in a large circular motion around a center "eye." Hurricane season in the Atlantic officially runs for six months, from June 1 to November 30. Most hurricanes occur in August, September and October. Bermuda is usually quite well protected by its reefs but high waves on top of a storm surge can cause problems in low lying areas close to the sea. When hurricanes strike, their damage to hotels and private dwelling houses is often superficial compared to other places. One major reason is because by law all buildings must be solidly built out of Bermuda limestone or concrete blocks. Compare this to coastal areas of the USA where wood, not stone, predominates. While all of Bermuda is coastal - no part of Bermuda is more than 1.5 miles from the sea - Bermuda lacks a gradual undersea slope, which is a primary cause of severe storm surge. But Bermuda's flora - trees, flowers, vegetation and the like - and fauna are not protected from hurricanes in the way many buildings are. Bermuda often gets electrical outages from gale force winds. This means no power for sometimes hours or days or weeks - and because of the electrical outages no water can be drawn, except manually in buckets if these are available, from underground tanks in local homes. Their only way to get water for basins, baths, sinks, showers and toilets is by electrical pumps from water tanks from each property. There is no central underground water supply. Also, telephones can be out for weeks - and cable TV for well over a month, as in September 2003. The most recent hurricanes were in 2014. Hurricanes affecting Bermuda, the Caribbean islands, North America, etc. used to be named after saints, according to the book 'Hurricanes', by Ivan R. Tannehill. Hurricane Santa Ana struck Puerto Rico in 1825, and two San Felipe hurricanes reached the island in 1876 and 1928. The Hurricane Center began giving Atlantic tropical storms people's names in 1953, when the US abandoned a plan to name them after its phonetic military alphabet, such as Able, Baker and Charlie. The Geneva-based World Meteorological Organization now maintains the Atlantic lists and ones for three areas of the Pacific Ocean; two sections of the Indian Ocean; and the Philippines, Papua New Guinea, Fiji and Australian regions. Those lists are reused at different intervals and contain indigenous names, such as the Thai name Prapiroon. All the names were women's until 1978, when men's were included for some Pacific storms. In 1979, male names were added to the list for the Atlantic and Gulf of Mexico region, known as the Atlantic Basin. The names alternate between males and females and also between English, French and Spanish origin. Followed by the Greek alphabet, if needed. Names are given to tropical storms, which are those with sustained winds of at least 39 miles an hour. When winds blow consistently at 74 miles an hour or more, the storm becomes a hurricane. 1609. Bermuda was colonized in July as the direct result of a hurricane. On July 24, a hurricane sank one ship and threw the flagship Sea Venture so far off course that it was wrecked on a reef in Bermuda on July 28. All 150, including John Rolfe and his pregnant wife were saved. But Mrs. Rolfe and her daughter Bermuda died in Bermuda. The colonists rebuilt two boats from the wreckage. See Admiral Sir George Somers colonized Bermuda. 1619. November 1619. A decade after the Sea Venture storm, another hurricane struck the island, sending the Earl of Warwick's ship, Warwick, to the shallow bottom of Castle Harbour. 1620. After being toppled by a hurricane, Moore's Mount was rebuilt just after Easter by Governor Butler as a triangular work. 1629. At St. George's, Butler's watchtower was thrown down the hill by a passing hurricane. 1689. Governor Richard Coney complained to the Lords of Council in London how great storms constantly made him and his family take shelter at a neighbor's house. 1712. September 8. The first of two severe hurricanes hit the Island. Many of Bermuda’s historical buildings, including St. Peter’s Church in St. George’s, were damaged. Since Bermuda’s first settlers had built almost everything out of cedar wood, including commercial buildings and churches, many were destroyed. It was as a direct result of these hurricanes that the decision was taken to construct buildings from limestone, as opposed to wood and thus withstand hurricanes better. New construction methods were developed to cut stone from hillsides to create solid limestone buildings of which many still exist. 1780. October 10. one of the most severe hurricanes ever recorded struck Bermuda. Fifty ships were driven ashore, with much damage. Houses were destroyed. Cedar trees were torn up bodily by the roots. The tide rose to a great height. It was known as "The Great Hurricane" having earlier hit Barbados with winds upwards of 200 miles per hour and caused widespread death and damage, before marching up the West Indies chain and onwards to Bermuda. It's death toll has not been exceeded. 1831. August 11, 12, 13. Bermudians were amazed to see the sun with a decidedly blue appearance, giving off an eerie blue light when it shone into rooms and other enclosed places. Ships at sea as far west as Cape Hatteras reported that "their white sails appeared a light blue colour." A month later it was learned that the astounding blue sunlight had coincided with a terrible hurricane that caused 1,477 people to lose their lives. It was assumed that the hurricane was intensive enough to cause unusual disturbance in the higher atmospheric strata, and refraction, diffraction or absorption of light rays, to cause the blue reflection. 1832. June. Powerful gales swept Bermuda. 1836. A hurricane breached the Dockyard's North East Breakwater and stopped work on Timlin's Narrows. 1839. Governor Sir William Reid arrived in Bermuda (and stayed until 1846). He was the author of "The Law of Storms, based on his study of the aftermath of the Barbados hurricane of 1831 which killed 1,477 people there. For that first scientific study of hurricanes, Reid was elected a Fellow of the Royal Society of London for the Improvement of Natural Knowledge, the oldest learned society still in existence. One of his first duties, which he took very personally, was to begin the Public Library as we know it today, now the Bermuda National Library. Also, Governor Reid caused the revitalization of agriculture, as a direct result of which the first agricultural exhibition (now an annual tradition) was held that year. He had reckoned, correctly, that the island should be able to feed its people in case of war with the USA which might mean that the Royal Navy would be far away at sea and unable to defend Bermuda, with starvation possible and surrender the only option. With this strategic option in his plans, he also recommended successfully to London that British Army units in Bermuda be beefed up; military authorities begin to acquire land, mostly in Devonshire Parish, to create a formidable presence in Bermuda; and that forts be improved, re-armed, re-stocked. As a further tribute to him, Reid Street in Hamilton became the new name of the through way. 1839. September. A hurricane caused great damage. It occurred while Sir William Reid was here as Governor, which gave him further insights into hurricanes, on which he had published the first scientific tome on such a stormy topic the previous year. 1889. September 12/13, a hurricane devastated the Causeway linking St. George's Island to the Main Island. It had to be rebuilt. Also destroyed was the Breakwater at the Dockyard, which had to be repaired. 1900. September 17. Winds of hurricane force. Near miss. 1915. September 3/4, a hurricane caused the steamer Pollokshields to be wrecked on the reefs of the South Shore. The master lost his life. Heavy rain and 82 mph winds. 1916. Hurricane on September 23. 1917. September 4, storm with unprecedented tides. 1918. September 4/5. Direct-hit hurricane. 1921. September 15. Almost direct-hit hurricane, with 120 mph gusts. 1922. Hurricane direct-hit on September 21. Winds to 120 mph and 8-foot storm surge. 1923. September 30. Storm passed to NW with winds up to 62 mph. 1932. November 12. Storm passed 100 miles to east, with wind gusts to 91 mph. 1939. October 16. Hurricane passed 50 miles east, winds up to 100 mph with gusts 131 mph. Heavy rain. 1947. October 20. Hurricane 40 miles to NW with winds up to 100 mph. 1948(i). September 13. Hurricane 50 miles to west, 800-100 mph winds, telephones and power cut. 1948(ii). October 7. Hurricane direct-hit. Winds 110 mph. 1953(i). September 5. Hurricane Carol passed 200 miles west, giving Bermuda 50-60 mph winds. 1953(ii). September 12. Tropical Storm Dolly passed over, but only with rain and gales. 1953(iii). September 17. Hurricane Edna passed within 50 miles with winds of 120 mph, torrential rain and much damage to roofs. Three persons were injured. 1958. September 28. Hurricane was 230 miles off, with 30 mph winds but pounding surf. 1961. October 6/7. Hurricane Frances veered away, little wind but pounding surf. 1962. October 6. Hurricane Daisy misses by 120 miles, winds to 66 mph with heavy surf. 1963. August 9. Hurricane Arlene a direct-hit, winds to 90 mph, much damage to vegetation. She had been threatening the Island for almost a week before she came ashore. In her wake she left hundreds of boats, homes and vast areas of vegetation destroyed or damaged. It was the first time in a decade that a hurricane had not veered its course away from the Island. 1964. The outer bands of Hurricane Gladys lashed Bermuda with winds but little damage if any was officially reported. However, it caused some problems. At the USA's Naval Operating Base, Bermuda, the emergency duty station for military personnel based there was the motor pool, which at that time was located in the old seaplane hanger. They were safe enough, but were basically trapped without food. Several attempted to reach the galley for supplies but were driven back by the storm. At one point the eye passed directly over the base. They jumped into several vehicles and raced to the mess hall to stock up of food and ran back to the hanger as the eye passed by and the storm resumed. Other than the above-mentioned US Navy base in Southampton Parish, which had it's own power house and underground utilities the only light visible from the base was Gibbs Hill Lighthouse. 1965. Hurricane Anna was not a direct threat to Bermuda. 1966. August 31. Fringe of Hurricane Faith, heavy rain and winds to 62 mph. 1971. September 23. Hurricane Ginger passed south of Bermuda, with heavy waves and gale force winds for 17 hours. But there was no loss of life or damage. The hurricane's passage failed to alleviate persistent drought conditions. However, the threat caused the Royal Navy presence in Bermuda to evacuate a ship, the US military evacuated some aircraft and two visiting cruise ships left early to avoid the threat. 1973. July 3/4. Hurricane Alice, minimal 26 miles away, but heavy rain. 1975. September 26. Hurricane Faye 40 miles away, strong winds, heavy rain. 1977. September 27. Hurricane Dorothy 60 miles to SE, heavy rain. 1981. September 7. Hurricane Emily passed over, only with 35 mph winds. 1987. September 25. Hurricane Emily, only a Category One, moved unexpectedly swiftly, causing tornados, chaos and much damage. With wind gusts recorded up to 125 mph, many were caught off guard as the storm was expected to miss the Island. Small, but vicious and spawning several tornadoes, Emily caused widespread chaos and damage - mostly to cars and boats, though houses experienced severe damage during the storm’s passage as well. St. George’s was hit hard, as was the Hamilton Princess hotel when all 80 windows shattered. More than 100 people were treated at King Edward VII Memorial Hospital for broken bones from flying debris and part of the hospital’s roof was blown off. Ultimately Emily caused $35 million in damage to the Island. No one was killed but Emily was the strongest hurricane to hit Bermuda since 1948. 1989. August 4. Tropical Storm Dean 23 miles away with 90 mph winds. 1991. October 27/29. Hurricane Grace forms in Bermuda area, hovers, gave massive seas. 1995. August 14. Hurricane Felix 50 miles away, winds up to 75 mph, pounding surf for 3 days on South Shore. Felix was expected to pass within 14 miles of Bermuda but suddenly veered away, saving the Island from a direct impact. Despite that, Bermuda felt hurricane-strength winds for more than eight hours, and a long-awaited Independence referendum had to be postponed. The storm cut the power to around 18,000 homes and caused an estimated $2.5 million in damages. 1996. October 20. Hurricane Lily 140 miles to SE, rain and 42-knot winds. 1997. October 8/9. Hurricane Erika 300 miles away, no damage. 1998(i). September 2/3. Hurricane Danielle 200 miles NW. Rain, thunderstorms, winds to 46 mph. 1998(ii). September 21/22. Hurricane Karl formed near Bermuda. Winds were up to 44 mph with heavy showers and thundershowers. 1998 (iii). November 6. Hurricane Mitch. Extensive damage beyond Bermuda but heavy rain and wind gusts in Bermuda to 69 mph. 1999. September 21. Hurricane Gert passed 120 miles east of Bermuda. Wind gusts of up to 75 mph, many beaches damaged. 2000. September 16. Hurricane Florence 60 miles away. Winds up to 50 knots. 2001(i). September 9. Hurricane Erin was 90 miles to E. But with only tropical storm force winds that caused battering waves and some coastal erosion. 2001. (ii) October 7. Tropical Storm Michelle threatened but fizzled on approach. Little damage. 2001. (iii). October. Although Karen didn’t become a hurricane until she was already moving away from the Island, the system caught Bermuda by surprise, rapidly building from a low-pressure disturbance to a tropical storm on our doorstep. Winds reached 74mph, near-hurricane status, destroying vegetation and downing power lines, leaving more than two-thirds of the Island without power. 2002. September 30. Hurricane Kyle came within 100 nautical miles to the south, but with little effect. 2003. September 5. Hurricane Fabian ravaged Bermuda. It was the strongest storm to hit Bermuda's coast in four decades. It began mildly when Bermuda woke to winds gusting between 25 mph and 37 mph as Hurricane Fabian had it sights set on Bermuda. The hurricane approached the Island from the south, south-west and moved north. The eye of the storm, which was 50 miles from north to south and 30 miles from east to west, then travelled across the Island bringing the highest winds. The wall of the eye skirted to the West sitting on the Island for about three hours in the north-east quadrant, traditionally the strongest part of the storm. By 5.55 p.m. when the strongest winds of 150 mph were recorded, the Island had already lost four lives on the Causeway. They all died when they were swept from the Causeway during the hurricane. P.C. Stephen Antoine Symons, 37, P.C. Nicole O'Connor, 29, Station Duty Officer, Gladys Saunders, 48, were trapped on the bridge in one car. Stephen Antoine Symons 'Chicken', 37, was one of two officers escorting Station Duty Officer Gladys Saunders, back to her home in Duck's Puddle, Hamilton Parish. A civilian, Manuel Pacheco, 23, an employee of the Corporation of Hamilton, was stuck in a second care behind them at about 2.30 p.m. He was returning home after securing his boat in St. David's. Although attempts were made to save them, fire fighters, police officers and a constructions worker had to abort the mission when the storm became too bad. The body of P.C. Symons was found two days later and the other victims were never seen again. During the day of Fabian there were reported gusts closer to 160 mph, however, around 4.55 p.m. the Bermuda Weather Service's monitoring equipment had shorted as water surged eight feet above sea level and recording stopped for two hours. The Weather Service crew were lucky to still have equipment to monitor after their meteorologist Brian Kolts told the Royal Gazette that five more knots would have blown the roof off their bombproof US military-made shelter. At about 6.55 p.m., the eye was north of Bermuda and the winds switched direction to come from a westerly direction on the comparatively weaker side of the storm. And by 11.55 p.m the next day, the hurricane winds had officially passed over the Island, with sustained speeds of 40 knots (46 mph) gusting to 52 knots (60 mph) hitting the Island. From then on, there was a steady decline in wind speed as Fabian blew out into the Atlantic northwards, and by 4.55 a.m. on Saturday the Weather Centre was barely registering tropical storm conditions, with sustained winds at 36 knots (41 mph). But what it left in it's wake was anything but calm. Estimated costs for damage from the storm ran in the area of $300 million. Around 25,000 out of 32,000 homes and businesses were left without power, though by mid-afternoon on Sunday, BELCO reported that 11,000 homes had their power restored. A 20-strong team from the Caribbean Electric Association, in Cayman, arrived on the Tuesday to offer help where they could. The East End of the Island, however, was cut-off for days after the Causeway was impassable. Days later it was open to one-way traffic, but still closed at night and finally in October the main artery of the Island was running as normal. Bermuda's hotels suffered, with the majority of the Sonesta Beach Hotel's roof flying off and the Fairmont Southampton also struggled to replace its roof. Fabian conveniently hit at the beginning of the school year and meant the opening of Government schools was delayed a week and they did not open until September 15. St. George's prep spent months recovering after the storm which wreaked havoc on the building and two years after Hurricane Fabian ravaged the Island The Department of Parks and the Ministry of Works and Engineering started repairing the entrance to Church Bay, which was badly damaged. Later, the September 5th Foundation, a registered charity, erected a memorial bench in Kindley Field Park, near to the scene of the tragedy. The foundation since created a scholarship fund for the Fabian victims' children. 2006. September. Hurricane Florence caused only superficial damage overall. 23,000 out of 68,500 residents had electricity outages. Only one hotel was damaged, with the beach of another having disappeared. American and Canadian newspapers, Internet services and other news sources gave the hurricane extensive coverage but there was no mention of it in the United Kingdom's BBC or newspapers or European equivalents. 2010. September 19. Hurricane Igor, predicted to be a monster storm — a 500-nautical-mile-wide Category Three — the system collapsed before landing, but side-swiped the island during the night with high winds, waves, rain and some flooding in places. However, caused no deaths or serious injuries. Damage was mostly superficial as homes and hotels are stone-built, not wood. But trees fell onto roads and electricity, cable TV, radio, television and Internet outages occurred. No mention in the UK. The hurricane was reduced to a Category One storm by the time it neared the Island, and did not come as close as anticipated. However the storm still caused flooding in Somerset and St George’s and tore several boats from their moorings, including Government tender Bermudian. Around 80 percent of Belco customers, 28,700 homes and businesses, lost power. Electricity was restored to all but 5,600 homes the next day. 2012. September 5. 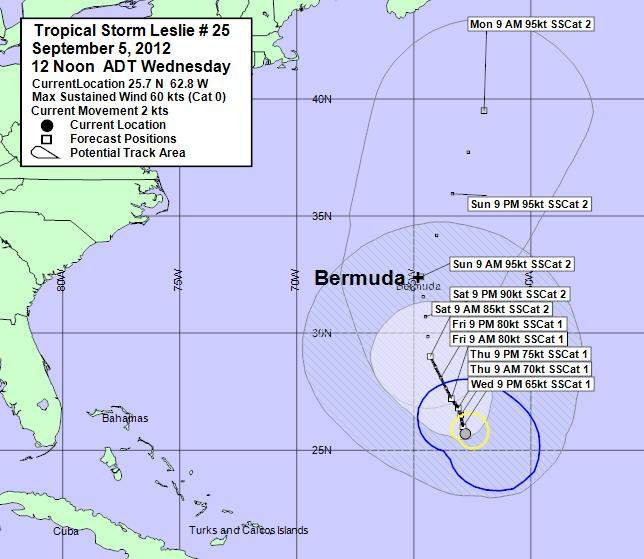 Tropical Storm Leslie posed a threat but did not last. 2014. October 12. Bermuda was hit hard by Tropical Storm Fay which had been forecast by US sources to pass to the east as a mere tropical storm or category one Hurricane. Instead, it strengthened suddenly and passed directly over Bermuda without any prior warning. Residents experienced 80-120 mph gusting winds later reported to have peaked at 155 mph. Coconut trees and other trees collapsed, blocking access to houses. Many roofs were damaged. All schools were closed and one lost its roof. Two thirds of homes lost electricity when overhead power lines were blown down. Electricity outages meant no power, no running water, no flushing toilets, no fridges or air conditioning, no radio or TV or Internet. Many boats were wrecked and shipping containers were blown from the Port Of Hamilton into the harbour. This was a fast, furious but short-lived hurricane. 2014. October 17. Bermuda received a direct hit from Hurricane Gonzalo only a week after its last event, but because of earlier warnings, this time was well-prepared. Airlines stopped flying beforehand for the duration and cruise ships, intended for Bermuda, visited other ports instead. Once again coconut trees and other trees collapsed, blocking access to houses. Some roofs were damaged or lost. All business and schools closed early. Two thirds of homes lost electricity. Electricity outages meant no power, no running water, no flushing toilets, no fridges or air conditioning, no radio or TV or Internet. Some boats were wrecked. Britain's Royal Navy sent a warship to help recovery efforts and Caribbean (from 900 miles away) electricity suppliers were on standby. 2015. October 4. Hurricane Joaquin passed within 75 miles of Bermuda, lashing the island with torrential rain. But there was no major damage. 2016. September 24. Tropical Storm Karl brushed past the island with minimal impact, but more than 800 Belco customers were without power — and the Department of Parks is advising swimmers to avoid waters on all South Shore beaches, as the surge remained high. 2016. October 13. Hurricane Nicole, then at Category 4, hit Bermuda. It created some serious damage to the island’s infrastructure. It caused walls and roads to collapse, tore roofs off buildings, ripped up trees, smashed boats against rocks and flooded numerous homes and roads. Walls were damaged along the Causeway, the only route to and from the airport. The Royal Bermuda Regiment was a principal player during and after. Many power lines were downed. Flooding victims included Victor Scott Primary School, while Bailey’s Bay Cricket Club’s structure suffered extensive damage. Residents near Elbow Beach report a significant outflow from a broken pipe. Other damages are significant. No major marine incidents took place during the storm. Many houses around the island were damaged. Nicole was the biggest hurricane of recent years to make landfall. 2017. March 9. The US National Oceanic and Atmospheric Administration has released its report on Hurricane Nicole, which passed over the island last October. While the hurricane weakened before reaching Bermuda, saving the island from the worst the storm had to offer, it still reportedly caused around $15 million in insured losses. The report stated: “Nicole caused widespread damage on Bermuda. However, media accounts suggest that the damage was not severe, likely because of the short duration of strong winds and the well-constructed infrastructure on the island. The cyclone snapped trees, toppled power lines, peeled off roofs and flooded homes and businesses. In addition, large waves damaged and broke boats from their moorings and also contributed to road damage around the island. The Bermuda Business Development Agency estimates total insured losses of $15 million, which matches preliminary qualitative accounts from the Bermuda Meteorological Service suggesting that the damage was less severe than that from Hurricanes Fay and Gonzalo of 2014.” Hurricane Nicole had reached Category 4 strength at around midnight on October 12, hours before reaching the island, but the report stated then began to weaken rapidly due to a sharp increase in wind shear and abundant dry air. 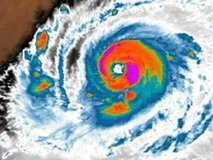 Nicole’s northwestern eye-wall passed over Bermuda on the morning of October 13, generally producing Category 1 hurricane conditions across the island; isolated areas observed sustained winds of Category 2 strength,” the NOAA report stated. The timing of the storm’s landfall also reduced its impact, with the system’s storm surge coinciding with low tide. 1. Pressure 28.94 inches or more. Wind speed of 74 to 95 mph, 4-5 foot storm surge but not much damage. 2. Pressure 28.50-28.93 inches. Wind speed of 96 to 110 mph, storm surge 6-8 feet., moderate damage. 3. Pressure 27.91-28.49 inches. Wind speed of 111 to 130 mph, storm surge 9-12 feet, damage extensive. 4. Pressure 27.17-27.9 inches. Wind speed of 131 to 155 mph, storm surge 13-18 feet, damage very extensive.